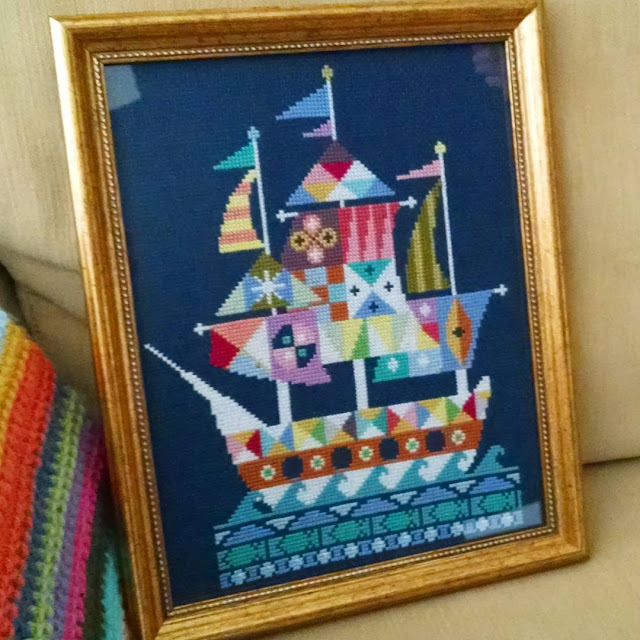 I'm so excited to share my finished pirate ship cross-stitch today! The design is called Voyage, and it comes from the brilliant Jody Rice, modern cross-stitch designer and proprietor of the Etsy shop Satsuma Street. If you haven't checked out Jody's shop, I recommend that you do so immediately. She has so many wonderful designs. (I have no connection to Jody, I'm just a really big fan). I loved working on this piece. I started around late May, just before the end of the school year, and worked on it throughout June and July. This piece was a little different from others I've made, in that there are lots of little areas of color, which meant more floss changes. I was a bit intimidated by that at first (I really like stitching big areas in one color), but I soon found it enjoyable and exciting as I watched the design take shape. I especially enjoyed working on the flags and sails, and also the part of the boat with the colorful triangular pattern from one end to the other. This ship is bold and graphic, but it also has a cartoonish feel; sort of Peter Pan, sort of Scandinavian, I think - a colorful vessel full of gentle, Disney-fied Vikings. I stitched my ship on navy blue 14-count Aida cloth with a variety of different flosses from my stash. I only needed to purchase about five skeins to make this piece - everything else came from my collection of newish DMC flosses, as well as a sizeable collection of "antique" flosses given to me by my mother-in-law. They include Anchor and Coats & Clark flosses, as well as the more exotic Rose and Mez brands. For my ship, I matched colors as closely as possible to the design. Some are slightly different; I worked with what I had. As I often do with stitched pieces, I framed this one myself. I won't offer a tutorial, as I don't think I have any real expertise in this area. I'm happy with it, though, and I think the frame works well. I wanted something a little bit gaudy, both to set off the dark background and to add some glitz to the gallery wall in our family room where I've hung it. But I also wanted to be a little bit tongue-in-cheek about it - pirates, gold, treasure - just for fun. I really wanted a scrolly, ornate frame, but the ones I found were a bit expensive and they looked silly with the more conservative black photo frames in my wall display, so I went with a simpler gold frame with delicate beading along the inner edge - subtle gaudiness suits me just fine. My gallery wall is a work in progress; I'm still not sure what else to hang up there but I know a lot of it will be handmade. I love the way my ship looks on the wall, adding color and balance just where I needed it, with a bit of sweet whimsy on the side. its absolutely beautiful - wonderful job! That is just lovely, you must be delighted. Really beautiful and the frame sets it off perfectly. Brilliant. Your stitching is so neat! Well done on such beautiful cross stitching Jennifer! It is a lovely design and looks so nice framed and on the wall. It looks amazing, I love how you have framed it too, a professional job. It really turned out well and you did a good job of framing it. Love all the color changes, more work for you, but makes a spectacular picture. It's fabulous, you've done a good job with it, even the frame has been thought about. 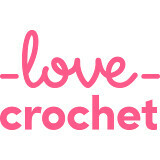 I found the Satsuma Street blog shortly before you started working on this project, she does have some lovely designs. How do you manage to get all the creases out of the fabric once it's finished? I've found that even if I iron when still damp, the creases are really stubborn and can't be removed completely. Wonderful to see the launching of the pirate ship, Jennifer, and how stunning it looks. The gold frame is a stroke of genius, setting off the colours beautifully. I love it! I love its whimsical look, Jennifer! What you said about liking to see the pattern emerge as you did all the different colours is the same reason I like doing Fair Isle knitting. Brilliant Jennifer, and so different and therefore a good contrast to Alicia's designs. 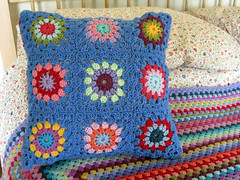 I really love the punchy colours and you have stitched it beautifully - as usual! Love this piece - so cute! Great job. So pretty and whimsical. I can definitely see Peter Pan guiding this ship through magical waters or clouds. How did I possibly miss this post? I've been waiting to see it finished. It's fantastic Jennifer! I love it so much. The frame you chose is perfect for it. Wow that looks terrific! And the frame suits it perfectly. Am I the only person who thinks the blue & white triangle flag looks like an owl? I see it in every shot . . . Maybe it's just me! 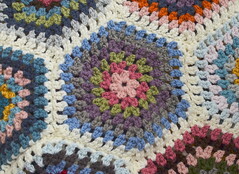 It's so lovely...beautifully colourful and it seems like you really loved making it too. BEAUTIFUL Jennifer! I love the pretty colors -- and, well, just everything about it!